Hyundai Motor recently unveiled the ’Le Fil Rouge’ concept car at the 2018 Geneva International Motor Show, marking a new beginning for Hyundai design and providing a glimpse of its future design direction. As its name implies, ‘Le Fil Rouge’ (English translation: common thread) is a reflection of Hyundai’s belief that the brand’s past, present and future designs are all connected. “’Le Fil Rouge’ is a reinterpretation of Hyundai’s design DNA that originated from the brand’s historical Hyundai Coupe Concept in 1974. Building on our long history of creating distinctive and sporty character in vehicles, we will open a new era for Hyundai design.” Said Luc Donckerwolke, Executive Vice President and head of Hyundai Design Center. “Our goal is to build a beloved brand by creating vehicles with heightened emotional value to reshape the landscape of car design. 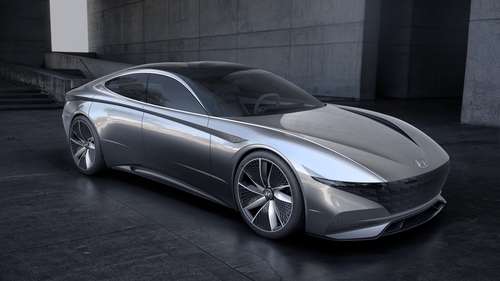 This is the foundation of our concept.” Added Sang-yup Lee, Head of Hyundai Styling. ‘Le Fil Rouge’ creates a proportional character based on the golden-ratio – a common mathematical ratio found in nature – which enabled Hyundai designers to create an aesthetically pleasing, natural-looking composition that embodies charisma. Proportional uniqueness is achieved through a long wheelbase, large wheels and short overhangs. A respectful dash-to-axle – the distance from front wheel centre to base of windshield – provides a comfortable driving position, while the higher beltline completes the overall look. With ‘Le Fil Rouge’, Hyundai took a new approach called ‘Light Architecture’, to integrate a progressive identity into the brand’s design heritage. 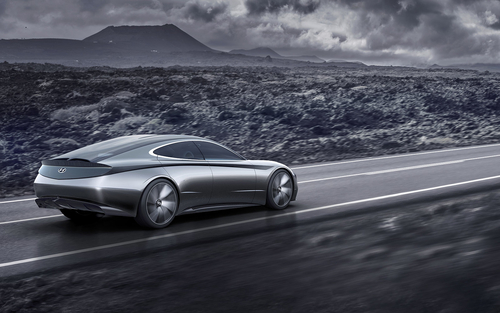 Light Architecture generates a dynamic look and forward motion effect for the vehicle. The front and the rear pillars, as well as the roof, are seamlessly blended into the overarching silhouette of the car – as though the car is drawn with a single line. 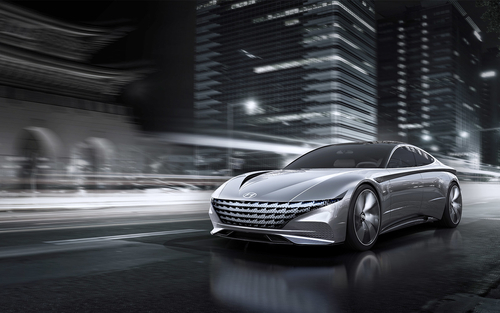 A core design principle for Hyundai designers was to create a design that enables a seamless experience of function. Inspired by aircraft ventilation, a two-way air ventilation system blows air over the curved surface of lightweight tube architecture. Meanwhile, a panoramic floating display coupled with haptic technology sits in front of the driver, providing access to intuitive controls for climate control and other vehicle configurations. Stay tuned to these pages for more information on Hyundai’s exciting, new ‘Sensuous Sportiness’ design language and which models will be redesigned or introduced using its unique sensibilities.